Time for some performance tests on Cosmos DB around Geospatial coordinates! Let’s hurt the service and see where it shines, where it has a hard time and how scaling it (i.e. increasing Request Units or RUs) helps. We’ll publish an how-to create the same setup in a future article so tests can be reproduced. In the meantime, the C# code for the performance test is on GitHub. We are testing Cosmos DB geospatial capabilities. Those rely on GeoJSON specification. We populated a partitioned collection with random data. The idea here was not to create a too artificial sample set containing only indexed geospatial data in a very compact form. Instead we have lots of noise. Actually, only %33 of documents contain geospatial data (the other %66 skip the location node). The geospatial location was taken on a rectangle containing the island of Montreal. The polygon coordinates are passed in parameter here. The query simply counts the number of point. We found that other aggregates (e.g. computing the average of a coordinate) yield similar performance. The polygon is built according to two parameters: radius & edge count. We basically “approximate” a circle of a given radius with a polygon of a given number of edges. The data here is sorted by elapsed time, i.e. the time the query took to return. Here we transformed the elapsed time in total milliseconds in order to get an integer value which is easier to plot (in Excel anyway). We observe the relationship is actually linear. 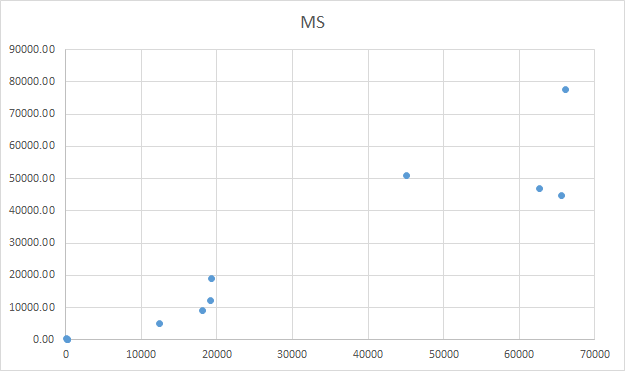 We can see that increasing RU from 2500 to 10000 improves the performance by an order of magnitude. Doubling the RUs to 20000 improves only by %50 while going all the way to 100000 doesn’t yield improvement. This is an important insight: depending on the query, scaling might or might not improve performance notably. Some of the queries performed pretty slowly with low RUs. As we observed those are the queries returning many points. This might be necessary for an application but often we want to limit the number of returned value. It is interesting to see that if we use another criteria in the where clause to limit the number of points returned, we drastically improve performance. The age property is randomly generated to be uniformly distributed between 0 and 99. The filter we just put should shrink the result set by a factor 4. It does: where the preceding query was returning more than 66000 points and take close to 80 seconds to run, it now returns 16293 and take below 8 seconds to run. Here we see the power of automatic indexing in Cosmos DB. The center and radius are passed in parameters here. Again the query simply counts the number of point. We notice the same thing than in the first test: the more points returned by the query, the longer it takes. We also notice the same improvement from 2500 to 10000 RUs and then the marginal improvement by increasing further. We did two main performance test for Cosmos DB geospatial queries: polygon inclusion & proximity. We strongly suggest you run similar tests with metrics closer to your workload in order to understand the performance profile of your query.